When a caller dials the tracking number during business hours (as defined by the schedule), the caller will be routed to the queue, which will dial agents as normal. If the caller dials the tracking number outside of business hours, they will be routed to the voicemail box. Effectively, all three versions of this route will work the same way (either the agent is available and answers, or the caller will be routed to voicemail). Depending on advanced settings on each part of your route, however, the caller may have a slightly different experience. In version 3, if your queue has waiting messages and does not have “bypass queue when agents are not available” enabled, the caller will have to wait a while (based on your queue’s settings) before being routed to voicemail. If you have multiple agents, each with their own schedules, each agent’s individual schedule will be used to determine where the call goes. In this example, schedules have been applied to multiple part of the call route. A “business hours” schedule has been applied to the tracking number, and one of the two agents in the queue has a schedule assigned to them. If a caller dials the tracking number outside of business hours, they will be routed to voicemail. 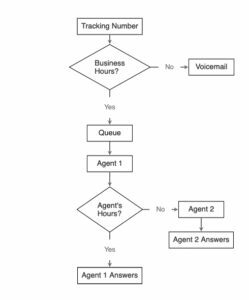 If a caller dials during business hours, but Agent 1’s schedule is not active, the caller will be routed to Agent 2. If a caller dials during business hours and Agent 1’s schedule is also active, the caller will be routed to Agent 1. Then, if Agent 1 is unable to answer (due to missing the call or being on another call), the caller will be routed to Agent 2.